Mounting pressure is growing daily for Karen Harshman to resign from the Washington County Board of Education. On Monday, Harshman shocked the community when she alleged in a Facebook post that she is aware of sexual predators teaching in Washington County Public Schools while further accusing her Board colleague, Jackie Fischer, as posing a threat to students. Of course, after school system authorities and police investigated Harshman’s allegations, spending hundreds of cumulative hours tracking down teachers and wasting precious taxpayer resources, they found Harshman’s claims were categorically bunk. Rightfully so, parents, teachers, school system officials and community members are calling on Harshman to immediately resign. Instead, Harshman is, incredulously, doubling down, but not in the way you would think. Child focused? Does that include failing to report teacher-student sexual abuse? Is child focused a euphemism for making false allegations against teachers without a single shred of fact, embarrassing yourself and the school system and causing parents shock and outrage? In 2014, Karen Harshman, ethically-challenged Mike Guessford and second-time candidate Stan Stouffer formed a Board of Education candidate slate. Since Harshman is not up for reelection this cycle, Stan Stouffer, Melissa Williams and Linda Murray are meeting regularly and appearing with Harshman for tactical campaign advice and strategy sessions. Melissa Williams is Harshman’s closest ally on the Board of Education, and she will almost assuredly lead Harshman’s public relations campaign to keep Harshman on the Board of Education when, in the near future, Harshman will likely be brought up on misconduct charges and expelled from the local Board of Education for her latest faux pas. You won’t find statements from Stan Stouffer, Melissa Williams and Linda Murray denouncing Harshman. Instead, you’ll continue to see them each hold campaign events with Harshman and hope her “star power” elects them to the Board of Education. Even Neil Becker, who leads the Association that endorsed Harshman in 2014, was intensely critical of Harshman’s outlandish misconduct. Becker and I do not always agree on the issues, however; his public denunciation of Harshman shows real leadership. 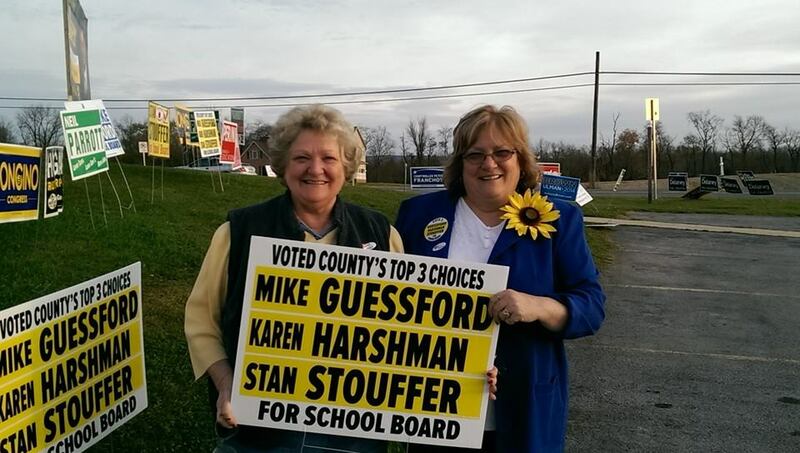 Just remember: Karen Harshman’s three picks for school board this year are Stan Stouffer, Melissa Williams and Linda Murray.